One in four is dissatisfied with their gyms, and one in 10 is very likely to change gyms in the next 90 days. 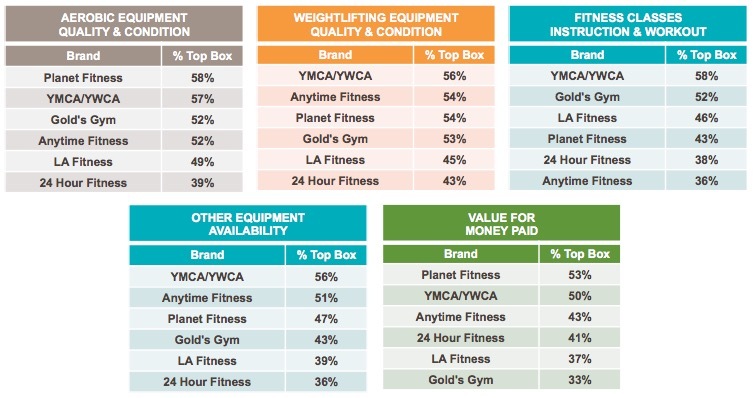 A new study by Market Force Information® (Market Force) found that consumers prefer their local YMCA or YWCA over all other national gym chains, and many gym-goers are planning to switch gyms in the next three months. 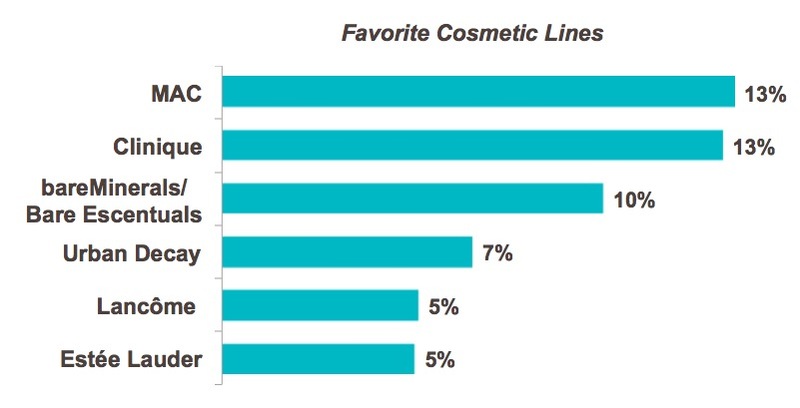 Market Force’s health and beauty study also revealed that MAC and Clinique are America’s favorite cosmetic brands, and Macy’s is their favorite department store for cosmetics. More than 2,700 consumers who reported having gym memberships with national brands participated in the fitness section of the study, which examined consumer preferences and trends related to workouts and fitness centers. The study revealed that Planet Fitness is winning the most market share, with 27% of participants holding memberships there, followed by YMCA/YWCA and LA Fitness. However, one in four is dissatisfied with their gyms, and one in 10 is very likely to change gyms in the next 90 days. YMCA/YWCA customers are the least likely to switch, which is not surprising considering it is consumers’ favorite fitness center. When Market Force evaluated fitness centers based on consumers’ satisfaction and their likelihood to recommend the center to others, YMCA/YWCA ranked first with 51%, followed by Planet Fitness with 47%, Anytime Fitness with 43% and 24 Hour Fitness with 35%. LA Fitness and Gold’s Gym tied for fifth with 32%. [See Graph 1]. Market Force also ranked the top fitness centers by amenities, and YMCA/YWCA led in nine out of 12, such as fitness classes, quality of weightlifting equipment, swimming pool and basketball courts. Planet Fitness took the top spots in the value and aerobic equipment categories, while Gold’s Gym ranked first for its aquatic classes and LA Fitness for its racquetball courts. What once were mandatory contracts seem to be going by the wayside. The study revealed 48% have gym memberships with a contract vs. 52% who have one without. Virtually no one reported paying per visit or using a punch card. While nearly two-thirds of those studied are hitting the gym at least weekly, one-third is only visiting a few times a month, at best. [See Graph 3]. While many gym-goers have tried working out with a personal trainer, not all were thrilled with the experience. Thirty-one percent of those studied said they’ve worked out with a trainer at their gym at least once, but just 39% were very satisfied by their progress. YMCA/YWCA and Anytime Fitness personal trainers received the highest approval of all the national brands studied. Which Cosmetics Brand is Queen? As part of the study, Market Force polled nearly 8,000 consumers to learn which brands and department stores are their favorites for cosmetics and why, as well as their cosmetics shopping habits. When it comes to makeup product lines, MAC and Clinique shine more than the rest. The cosmetics brands tied for No. 1 with 13% of the vote, followed by bareMinerals/BareEscentuals with 10%, Urban Decay with 7%, and Lancome and Estee Lauder with 5% each to tie for fourth. [See Graph 4]. The three product factors that cosmetics wearers said matter most are 1) wears well throughout the day, 2) brand trust and 3) easy application. Lower on the list are leak/spill-proof containers and products that are humanely tested or environmentally safe. Market Force ranked the top cosmetic lines in these areas and found Urban Decay rated tops for wearing well throughout the day, Clinique for brand trust and bareMinerals/Bare Escentuals for easy application. MAC was the value leader. [See Graph 5]. Thirty percent of respondents said they most frequently purchase their cosmetics from mass retailers such as Walmart or Target, 24% from specialty retailers such as Sephora or MAC, 16% from drug stores and 13% from department stores. Just 3% said they buy them from grocery stores. Macy’s took the No. 1 spot among department store chains, and was trailed by Dillard’s and Nordstrom. Makeup Artists – Who Puts on the Best Face? Twenty-eight percent had a makeup artist at a specialty store apply make-up during their most recent visit, especially those visiting MAC and bareMinerals/Bare Escentuals. However, 15% weren’t satisfied with the experience. Conversely, 35% had makeup applied by an artist at a department store, especially Nordstrom, and just 10% report being unsatisfied. The survey was conducted online in November 2016 across the United States. There was an overall pool of 13,184 respondents, with 2,782 participating in the fitness center study, and 7,970 in the cosmetics poll. The survey pool covered all four U.S. Census regions, as well as a broad spectrum of income levels. Respondents’ ages ranged from 18 to over 65.